With the city streets littered with so many different restaurants it’s never difficult to find a place to feed a growling stomach. But as is the case with most things in life, the best dining experiences are often hidden away from plain sight in the most unassuming of spaces. Newly opened Zhou Zhuang Kitchen offers just this type of experience. Housed on the tenth floor of one of the many unremarkable commercial buildings along Canton Road, this restaurant specialises in the traditional homestyle cooking of its eponymous town in China’s Jiangnan province. Stepping out of the elevator, we were quickly directed into the small, 40-seater restaurant. A quick glance around the room showed an interior décor as low-key as the location, with no more than a few neat rows of traditional Chinese opera masks aligning a framed calligraphy scroll on the wall. Given the restaurant’s ho-hum digs, we were all the more impressed by the extensive list of choices on the menu. Situated on the southern reaches of the Yangtze River, Zhou Zhuang’s cuisine shares many similarities with that of its neighbouring cities, including Shanghai, Hangzhou and Suzhou. This is duly reflected in Zhou Zhuang Kitchen’s menu, which lists well over 80 items, including Zhejiang-style chilled pork hock, and stir-fried Shanghainese noodles. Most of the dishes come in appetiser-sized portions, allowing us to sample a wider array of items. We started the meal with a small plate of chilled, shredded eggplant ($32). The soft strands of pulpy aubergine were bathed in an addictively tangy vinegar, soya sauce and sesame oil dressing. The piquant medley of flavours was the perfect way to kick-start our appetites. Next to the table was a serving of soft-boiled eggs ($12). Sticking to Jiangnan culinary tradition, the eggs were smoked to a tea-brown tint, giving the outer layer a strong, almost meaty flavour and aroma. While the whites were cooked to an opaque doneness, the encased yolk in the centre remained soft and perfectly creamy – an impressive feat that takes careful timing and culinary skill to achieve. The meal continued on a high with our final appetiser of sliced pork with garlic ($46). The dish appeared at the table – seven fat slices of white meat lay folded on a scant bed of shredded lettuce, slathered with a heaping mound of minced garlic which was dyed a bright scarlet red by the fragrant chilli oil. It was a delicious combination that was worth every bit of the lingering garlic breath. On the staff’s recommendation, we chased the garlic-smothered pork with a round of cold, Zhou Zhuang noodles ($38). 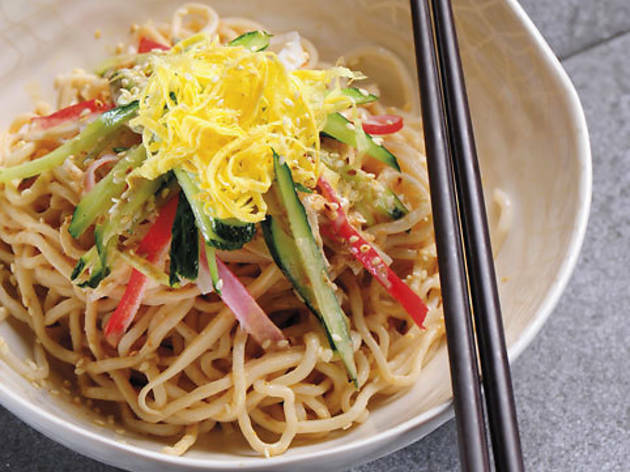 The mass of al dente noodles were doused in a generous amount of fragrant peanut sauce and further topped off with julienned cucumber, crabmeat and bits of sliced abalone. The sauce, while full on in flavour, was surprisingly and pleasantly light on the palate. 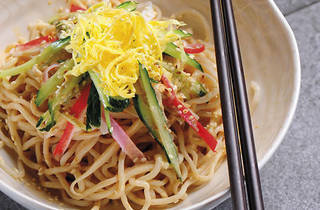 The crunchy fresh cucumbers, paired with the slight chew in the noodles and abalone added extra depth to the dish, making it an easy favourite for the evening’s meal. Following the stellar quartet of cold items, we were a little disappointed with the first hot dish of wontons in soup ($34). We had no complaints with the filling of tender minced pork and crunchy chopped greens, but the wonton wrappers weighed on the thick and overly doughy side. We found ourselves ignoring most of the lacklustre dumplings and lapping up instead, the light yet fortifying stock made from seaweed and dried baby shrimp shells. We rounded off the meal with an order of the restaurant’s signature northern-style roast mutton ($88). The skin was roasted to a delectable crackly crunchiness, reminiscent of a perfectly fired roasted suckling pig. This skin hid a plump layer of fat, followed by a part of tender meat that shredded apart easily for convenient devouring. Though there were only seven pieces on the plate, the fat-marbled richness of the mutton left us feeling well-fed and fully spoiled. The food at Zhou Zhuang Kitchen is by no means life-changing, but it’s the perfect kind of no-frills fare you’d want to share with close friends on a casual night out. It also helps that the staff try their hardest to ensure their guests are getting the best possible dining experience, making honest and, for the most part, spot-on recommendations, and steering patrons away from the weaker dishes when necessary. For days when we’re feeling overwhelmed by the dizzying, myriad dining options in town, this is exactly the sort of place we’ll be escaping to. 10/F, Canton Plaza, 82 Canton Rd, Tsim Sha Tsui, 2348 1008. Daily 11.30am-11.30pm. Meal for two: around $250.